To celebrate someone’s 17th(!) birthday, we jaunted off to Disneyworld for the weekend. The weather was hot and humid (welcome to Orlando in September! ), but the weekend was glorious. We tried to do this last year, but Hurricane Isabel decided to make an appearance, and we had to reschedule our trip. Making the trip in early September meant that our daughter could come with us as well before she left for her sophomore year in college. She was beyond excited, as it was 15 months since she last was at a Disney theme park. Disneyworld is where we celebrate the present, reminisce about the past, and create memories for the future. We have delighted in Walt Disney’s optimism, reveled in his belief that humans are capable of endless innovation and creativity, and criticized the parks/Disney where we thought it was merited. It is a place where we are forever children, looking with wide-eyed wonder on the future. It is, truly, the happiest place on earth. I LOVE the Little Green Men! There were a couple of highlights on this trip (and one major lowlight, which is that the 19 year old daughter wasn’t with us). It’s times like these when we’re accustomed to going places together as a family that I miss her the most. Nonetheless, it was a fun trip. The newest ride—Flight of Passage—based on the “Avatar” movie in Animal Kingdom remains a highlight. I thought the ride couldn’t possibly live up to my memory of it from October, but it does and then some. It’s a difficult ride to describe—it’s as if Soarin’ and Star Tours had a baby who emerged as a prodigy. Even if you haven’t seen the “Avatar” movie or aren’t a fan, the ride is still mind blowing in its visual impact and ride experience. Another highlight of the trip was the “giraffic jam” we experienced. We were on the Safari ride at Animal Kingdom when two adolescent giraffes proceeded to bicker (the human term for their behavior) in the middle of the road by swinging their heads at each other, using them as battering rams. It held up the ride for about 20 minutes and was hilarious for each and every minute, especially if you’ve ever had teenage children in the house. I’ve included a 4 minute video of it, courtesy of the 16 year old son. Bribes of lettuce and orders to move were tried to no avail. One of the park rangers finally convinced the giraffes to move off the road by nudging his truck slowly and carefully closer to them. (The safari ride trucks have to keep their distance.) Knowing the giraffes, I have no doubts that once we were safely by, they would be back at it. Teenagers! We were also guinea pigs for test runs of the “Minnie van.” Get it? The vehicle is painted in Minnie Mouse polka dots and bows and supplied with Minnie Mouse water bottles. Playlists of all four parks and each Disney hotel are available for your listening pleasure. It was traveling in (Disney) style! It was a wonderful opportunity to relax and enjoy the wonders of Disney before the end of school pressure cooker begins. The Disney magic definitely worked itself on us! We also visited Disney Springs (formerly known as Downtown Disney), which we have not been to for years. It, too, has grown and improved and is a nice place to visit in the evenings or whenever you want a little down time from the parks (as difficult a concept as that is to imagine). Our daughter elected to celebrate this momentous occasion of being able to sign legally binding contracts by spending it in Disneyworld. Fortunately, her birthday coincided with a school 3 day weekend, which made it perfect. We stayed at the Animal Kingdom Lodge, so we woke up each morning to the sight of giraffes, zebras, and other wildlife right outside our balcony. Thirteen years later, “Finding Dory” is Dory’s quest to find her parents. There are a few cameo appearances by Crush and the other sea turtles and a nice introduction/summary of “Finding Nemo” for those who haven’t seen it, but this is definitely Dory’s movie. Marvin and Nemo play strong supporting roles. But Hank, a mimic septupus, steals the movie. Voiced by Ed O’Neill (from “Modern Family” and “Married with Children”), he once again plays the curmudgeonly character with the heart of gold. Even more impressive is the animation that was required to give life to Hank. As the Disney representative explained to us, octopuses have no joints, which makes animation extremely difficult because there’s no joint to hang the motion off of. (They slither more than they move.) It took two years before the animators figured out a way to animate that movement. And each scene where you see Hank with all seven legs took months to animate. As a mimic septupus, Hank has to blend into his surroundings but still be obviously him—a tricky feat at the best of times and an added complexity to the animation. All of this is fascinating, of course, but has nothing to do with Pixar’s real strength, which is storytelling. I think anyone who knows a parent of or a child with special needs will relate to this movie, as Dory’s parents worry about her future, as Dory copes with her limitations and moves forward despite them, and as Dory’s friends appreciate her very real strengths. The movie ends happily, of course (it is a Pixar movie, after all!) but not without plenty of obstacles, tears, and emotionally fraught moments. It is a worthy member of the Pixar family. This movie received an enthusiastic thumbs up from all of us, and we are definitely going to go see it again! We haven’t been to Disneyworld for the Christmas season in years, but when we learned that this would be the last year of the Osborne Family Lights at Hollywood Studios, a visit was a must do and off to Orlando we went on the first weekend of December. We landed on Friday evening and headed straight for the lights. They were even more spectacular than I had remembered. Saturday morning was the Wild Animal Trek, something we had never done before. (Shock!) It takes place at Animal Kingdom, and half the trek is done with a harness so that you go over bridges and look at hippos and crocodiles up close and personal. The other half of the trek is essentially a VIP version of the Safari ride. The ride was particularly memorable for two reasons: first, there was a baby rhino out and about and feeling particularly frisky, chasing zebras and running around (so adorable! ); and two, we had a (successful) proposal in the group when we broke for lunch (also adorable). 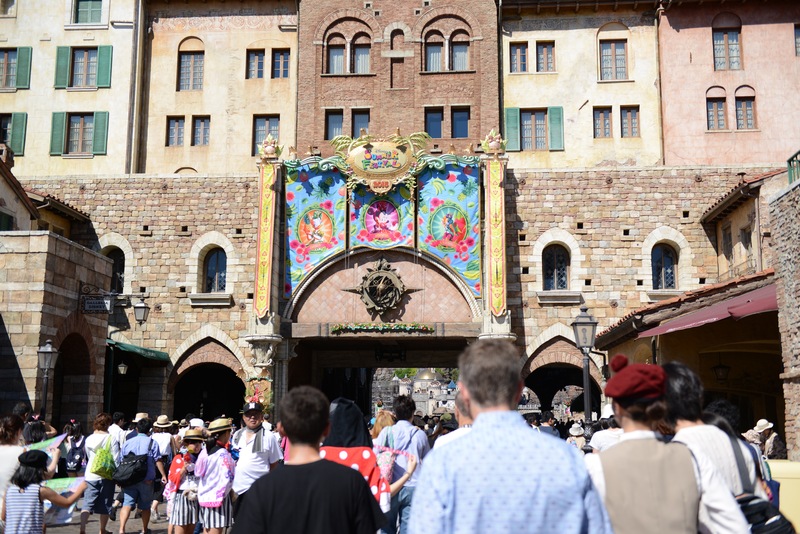 We had never been to DisneySea, and it was a really fabulous experience to visit a Disney park where everything was new. Our favorite rides there were Journey to the Center of the Earth and the Indiana Jones ride (which is based on the horrible Indiana Jones and the Crystal Skull movie). There is a Stormrider ride that is somewhat similar to the Star Tours simulator ride that is also very well done. 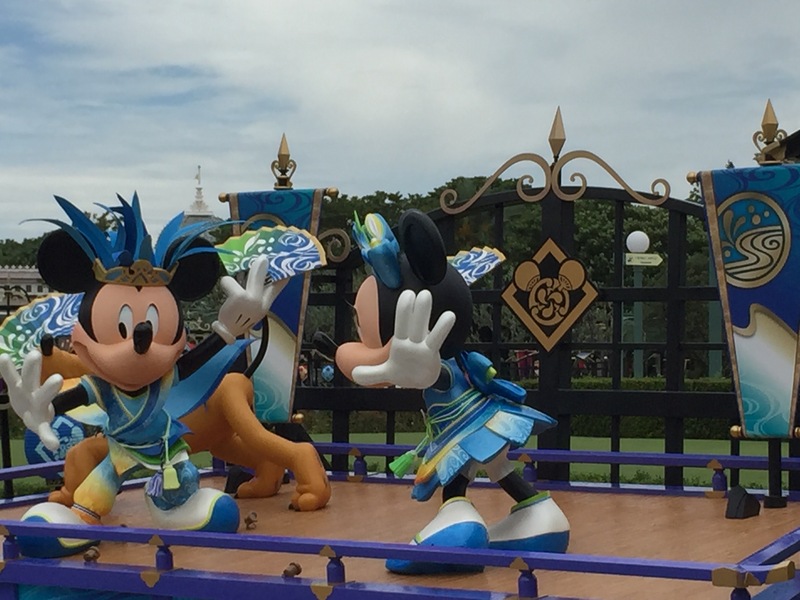 We had only been to Tokyo Disneyland once before. Once again, the Winnie-the-Pooh ride was our favorite (and it’s the best version of the ride in all of the Disney parks, hands down). We also loved the Buzz Lightyear and Monsters, Inc. rides there. And we are continually fascinated by the different flavors of popcorn available in the Tokyo Disneyland park—honey, chocolate, curry, teriyaki, and regular. Curry popcorn was the Ms’ favorite flavor, but Jim was NOT a fan. It was also fun to compare the design and rides with all of the other Disney parks. Yes, I know we are hopeless Disney addicts! We ate at a one Michelin star teppanyaki restaurant called Ukai-tei. It was an interesting combination of classically trained teppanyaki and classically trained French chefs in one restaurant (and chef). The food was fabulous, and it was a great experience. The USJLP alumni weekend was a tremendous amount of fun. There were over 70 Fellows who attended, and many more Americans than typical. The nice thing about having a critical mass of Fellows is that you don’t feel as much like you’re intruding on the delegates’ fun and bonding. It was really lovely to see all the Fellows, catch up on their news, and meet the delegates (some of whom I already knew from DC gatherings). 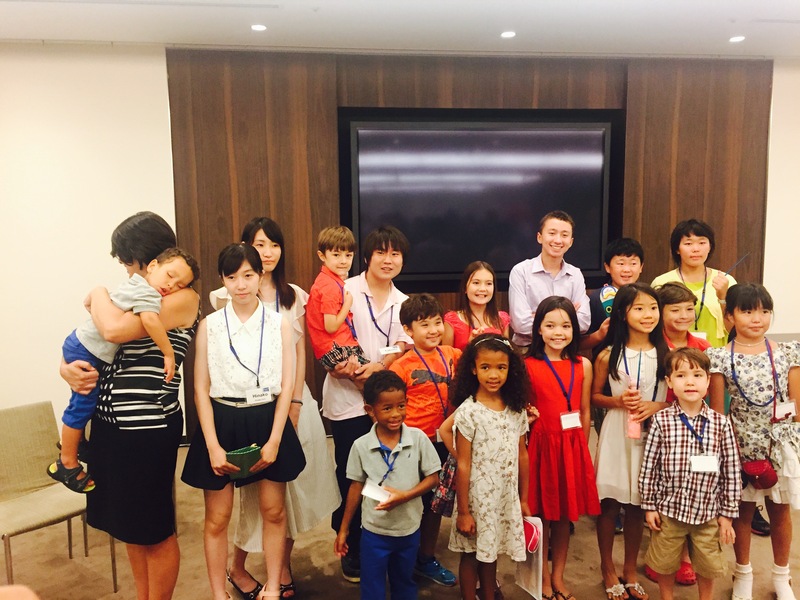 There was even a bonding amongst what we hope to be the future generation of USJLP-ers! 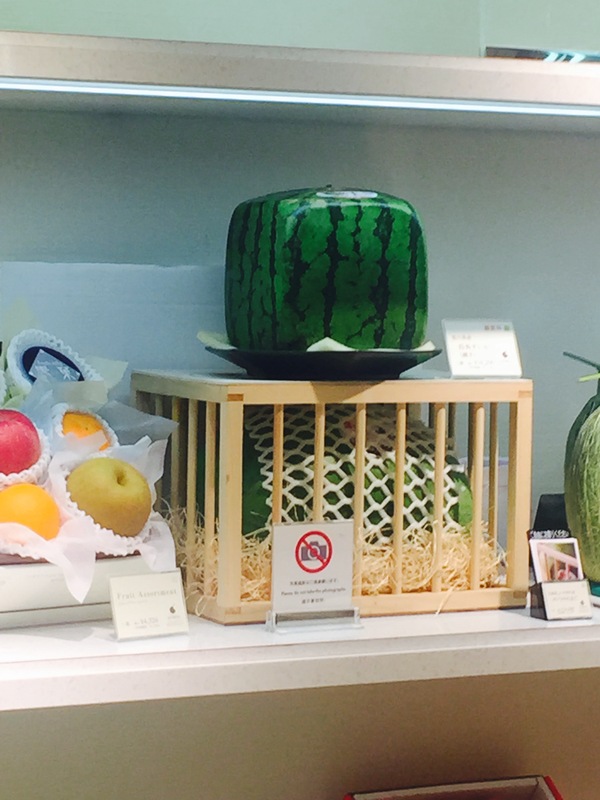 Oh, and I can’t forget that only in Japan can you find square watermelons! Once again, Pixar hits it out of the ballpark with a movie alternately funny and touching that appeals equally to kids and adults. The feelings in her head—Joy, Sadness, Fear, Anger, and Disgust—all have a role in how Riley copes with the move. Without spoiling the movie (since we all know that Pixar never does happy endings), Joy discovers that as much as Sadness is truly a downer, it is Sadness that allows Riley to reach out for emotional support and cope with her circumstances. I can’t imagine the pitch for this movie (“Uhh, we’d like to do a movie about what’s going on in an 11 year old girl’s head by animating her 5 main emotions”), but as with all Pixar movies, there is plenty of humor and pathos, triumph and tragedy. Kids will enjoy this movie immensely, especially those who have gone through the process of uprooting and moving, and adults will enjoy an all-too-brief nostalgic glimpse into their childhood (imaginary friends, anyone?). Pixar has demonstrated repeatedly that while the animation is important, the secret sauce is in the story. We enthusiastically give this movie a two thumbs up! Two very different movies, and both equally good in their own ways. “Big Hero 6” is a Disney movie and contains the classic Disney elements: a traumatic event in the first 10 minutes of the movie, a hero in conflict, and a guardian angel (of sorts) to help him. There are strong secondary characters as well with lots of superhero action sequences and comedic scenes to lighten the tension. And, in the end, the hero has to find his own solution and to discover what is truly important to him. It’s a well-done, entertaining, and thoughtful movie in the best Disney tradition. As with the best Disney movies, this one appeals well to the under 6 crowd, our action film-oriented 13 year old son, and our too-worldly-to-be-believed 16 year old daughter. We (the adults) liked it very much, too. The entire family gives this one two thumbs up. The final installment of “The Hobbit” trilogy brought about some mixed feelings. I absolutely loved the Lord of the Rings trilogy and thought Peter Jackson did a fabulous job of getting the spirit of the trilogy right. (I’m not one who expects complete faithfulness to the books—these are movies, after all, and adaptation is necessary for such a different medium. Also, while I am a huge Tolkien fan, I don’t believe heresy was committed in adapting the books to film.) I am more ambivalent about his adaptation of “The Hobbit,” however. The book is a much more light-hearted romp into Middle-earth than the Lord of the Rings trilogy, but the movies take a more epic and serious tone. The first movie of the trilogy (“The Unexpected Journey”) definitely dragged in parts, but the second (“The Desolation of Smaug”) was much better, and the barrel scene down the river has become one of my all-time favorite action sequences. This final installment focuses much more on the action sequences than any narrative (which is hardly surprising, given that the book is only 300 pages and is being stretched into three movies). Richard Armitage does an excellent job as Thorin Oakenshield and his transformation from being noble and kingly to being cursed with dragon-sickness and back again is convincing and heart-breaking. Martin Freeman is a highly underrated actor who is fabulous as Bilbo, a hobbit who keeps his humanity and moral compass when all around him have lost theirs. And for the Benedict Cumberbatch fans (o daughter mine! ), let’s just say that [spoiler alert here!] Smaug gets killed in the first 10 minutes of the movie. Our 13 year old son absolutely loved the movie and can’t wait to see it again. I enjoyed it very much and will probably take him for a repeat viewing. That being said, I suspect that ten years from now, when we are looking back at these movies, the Lord of the Rings trilogy of films will have held up much better and be more highly regarded than The Hobbit trilogy.